I believe that spending quality time with the kids, especially in their formative years, is the best expression of love and care. As a family, we often make it a point to visit different places and do different thinsg together. Kids crave for their parents affection and undivided attention, especially now that in most families, both parent are working, having to leave the house very early and coming home late at night. There is no better way to spend time with your kids than doing activities they love together with them. Entrance passes to this fun-filled bonding experience is at P750, good for 1 mom/dad and 1 child. Here are the activities lined up for October 19 and October 20! What’s in store for you and the little one? *Best for kids age 4 to 12. 3rd stop: Take a taekwondo class with Coach Stauro of Coach and Kids Development Philippines, Inc.
GET YOUR TICKETS NOW!!! Php 750 is good for mom or dad and 1 kid. 2. You will receive an email for payment instructions. All payment must be made via bank deposit within three days upon registration. 4. You will receive a confirmation email along with your e-ticket. 5. Present your e-ticket during the event. Through the graciousness of the event organizers, they are giving away 3 tickets to the October 20 event! Just follow the mandatory steps in the Rafflecopter below. The giveaway is open to anyone who can come to the October 20 event. Winner will receive e-ticket from the event organizers and you will need to print and bring the e-mail to the event. Giveaway starts October 11 until October 16. Winner will be notified the next day via email. Homeschooling is a global movement that is now becoming a viable option for Filipino families who want to provide their children with education beyond a classroom’s walls. Parents who are exploring, or are unsure of their homeschooling path, are encouraged to attend You Can Homeschool to gain an intimate look and understanding of home education. You Can Homeschool! Be Inspired, Be Informed, Be Empowered! Is a day-long event happening on November 16, 2013, Saturday, 10:00 AM – 4:00 PM at One Events and Café, One Corporate Center, Julia Vargas cor Meralco Ave, Pasig City. This conference is brought to you by Manila Workshops, a company dedicated to continuing education for professional and personal goals, and The Learning Basket, an advocacy that inspires parents to be their children’s first and best teacher. They have come together to offer an event jam-packed with information and inspiration about homeschooling that will help parents who are considering to educate their children at home. The key speakers of this event, Thammie Sy, Frannie Daez, and Edric Mendoza, have all found their calling in homeschooling their children. – Testimonials from children who have experienced learning at home. – An overview of the homeschooling providers in the country, and the various services that they offer. If you are interested to register, click here! In line with this event, Bee Happy Crafts and Party Supplies is giving away the following prizes to one of my blessed readers! Bee Happy Crafts and Party Supplies has a FB page at https://www.facebook.com/BeeHappyCrafts You can follow them at their Instagram account @beehappycrafts and Twitter account @BeeHapppyPh to see a complete list of their product list! The winner will also receive two tickets to Philippine Science Centrum. To join this giveaway, just click on the Rafflecopter below and complete the easy mandatory entries! Giveaway runs from October 7-21, 2013! One winner will be chosen randomly using Rafflecopter. Prize will be shipped to the winner by Manila Workshops. Giveaway is open only to Metro Manila residents. Babypalooza Bazaar is happening on August 17, 2013; 10 a.m. to 7 p.m.at Walter Hogan Conference Center, ISO, Ateneo de Manila University, QC campus. Now on its 3rd run, the Babypalooza bazaar will still highlight the same features that made the first 2 bazaars unique and successful: equal exposure for both PRE-LOVED (i.e. gently used) and BRAND NEW items for babies, young children and expectant parents. The Babypalooza Vendor Protection Program (VPP) will still be enforced to ensure that no two vendors of brand new items will be selling the exact same thing. This helps ensure that shoppers will not get bored from seeing the same merchandise over and over. Items that will be sold are necessities of parents and their children: clothing, shoes and accessories, gear, strollers/baby furniture, feeding bottles, nursing wear, breast pumps, skin care and cleaning products. Yummy, drool-worthy food products will also be sold during bazaar hours. All these at negotiable, easy-on-the-pocket prices! To continue providing a family-friendly bazaar experience, special function areas will still be available for free for all visitors, these are the following: Sulit breastfeeding station, The Maya Kitchen play area, 88DB Daddy Waiting Lounge and the Mega Soft diaper change area. This event is also graced by the participation of WhenInManila.com as one of its online media partners. Clean rest rooms are also just a few steps away from the bazaar stalls for added convenience. With the generosity of Babypalooza organizers and Oh My Dolls and Mommy & Baby Essentials, we are having a giveaway here for The Mommy Journey readers! OMD! Oh My Dolls 3D Facedolls is an online shop selling personalized stuffed toys. It is great for gift-giving or as party souvenirs. Mommy and Baby Essentials strives to meet all expectations of each visi. Being owned by a full time mom, the safety, quality and reasonable prices are very important to Theresa, the owner. So she sells only the same products that have made her pregnancy and mommy days both comfortable and even more joyful. To join the giveaway, use the rafflecopter below. Please make sure you complete all mechanics so that your entry will be valid. This giveaway is open NATIONWIDE as long as courier-accessible! Can also be claimed at the bazaar! Giveaway runs from August 5-12! We are a family of book lovers. One of our favorite publishing house in the Philippines is OMF Literature. OMF Literature’s s mission is to publish, import, and market books, other literary materials and related merchandise that are Christ-centered, biblically sound and culturally relevant in proclaiming the Gospel, making disciples, equipping Church leaders and drawing all, particularly the youth, to the Lord. They have recently just relaunched their website. The new OMF Lit website now offers more interactive features! What I really like is that I can now comment and share books through Social network sites easier! Along with this, OMF Lit is launching their new OMF Lit e-store! Finally, I can order books from their website and have it delievered right to my doorstep! Here are some good news too! As their opening week promo, all books you see on the e-store are at 20% off! That’s from May 20-31,2013! Here’s more! The first 50 people who register in the e-store get 50% off all books ordered there the entire week! Wait for their confirmation that you are part of the first 50. In celebration of this milestone and thanks to the generosity of OMF Lit, my readers will get a chance to win some of their previously released titles. 2 winners will be chosen to win a set of The Doppleganger Chronicles and a set of Ronald Molmisa’s books. These books are geared for tweeners, teenagers and young adults. Just complete the mechanics in the Rafflecopter below. Giveaway starts today May 24 until June 1! This giveaway is open nationwide. Christian Parenting Handbook Review and Grand Launch Giveaway! 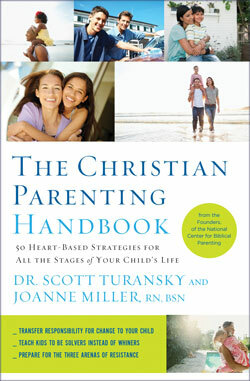 I have been shared with you last week that you should watch out for the grand launching of a great parenting resource, The Christian Parenting Handbook by Dr. Scott Turansky and Joanne Miller RN, BSN. I have been given an advanced copy to review this book and I must say that it is one of the parenting books you’ll want to have in your shelf. There are no formulas in parenting but the advices given are practical suggestions which you can easily follow in your own home. The strategies are all heart-centered which would cause a lasting impact in the life of the children. The chapters are short and easy to read. The book consists of 50 parenting tips and each chapter’s length is just right. The tips are relationship focused, enabling the parents and the child to look beyond issues and resolve differences together. As I read the book, I feel encouraged and know that I can do better in parenting. The author doesn’t put down or criticize other parenting styles but encourages parents to try their suggested tips. I know that I am a work-in-progress with my children and the lessons I am learning through this book will be a great help to my parenting. – Affirm right behavior. Instead of always pointing out your child’s mistakes or weaknesses, as the parent, we should affirm their right behavior more. – Move from the issue to the process. It is not enough to get the results but how the results were achieved is even more important. – Teach kids to add energy to family life. The kids need to learn to honor their parents or their siblings so that they eventually can become a good part of the society one day. – Consequences aren’t the only answer. Children need to know what is the positive thing to do instead of just receiving consequences to their action. There are so many more good parenting tips so I encourage you to buy a copy of this book. Now, if you have decided to buy this book, I recommend that you buy this book this week. Why? Because if you buy a print copy of The Christian Parenting Handbook between April 29 and May 5 , you get a package of free resources valued at more than $400.00. There are 8 video, audio and electronic items contained in the Bonus Parenting Package. Here’s what’s included in the $400 package when you purchase the book! That’s $404.60 of biblical parenting resources forFREE!!! In addition, you can get The Christian Parenting Handbook Companion Guide (This is a workbook with audio clips that will help you apply the material in The Christian Parenting Handbook.) for free if you purchase 5 copies or more of the book. You can make your purchase from Amazon, Barnes and Noble, BAM (Books A Million), CBD or Parable. To claim your premium, simply forward your purchase confirmation to Gift@biblicalparenting.org and they will send you your special product code for the $400.00 package. If you purchased 5 or more copies of the book, they will send you the PDF version of the Companion Guide along with the audio segments. To celebrate this launching week, the National Center for Biblical Parenting is hosting a mega giveaway! Also remember to come hang out on Tuesday evening April 30, 2013 at 7:30pm ET. “Live Google Hangout” Don’t forget the Twitter Party on Wednesday evening May 1 at 8:00 pm. Hashtag for the Twitter party is #heartparenting.